The following statement was issued in the name of the leadership of Óglaigh na hÉireann [the IRA] and was released through the 32 County Sovereignty Committee. The leadership of Óglaigh na hÉireann extend Easter greetings and solidarity to all our friends and supporters both nationally and internationally, we extend our thanks to anyone who has helped the republican cause in any way and express our gratitude in advance for your assistance in the future. Everyone can make a contribution to the Irish freedom struggle, no part is too small. The Republican movement wish to commend our volunteers for the courage, commitment and discipline they have shown in the face of huge odds, the republican struggle is entering a crucial phase with our enemies united in trying to end republican resistance once and for all, they will fail. In order to combat the forces of repression and partition republicans must think strategically and pragmatically. Republican unity must remain a key objective and aspiration for all republicans, for our part the IRA have worked closely with other organisations in every way and we will do so in the future. A united republican base is much more able to withstand the onslaught of the united forces of occupation. Special mention must be made of the republican POW’s in Maghaberry and their continued resistance to the torturous prison regime in place there. To those who say that the British occupation of Ireland has changed we say why, 30 years after 10 brave comrades died in British jails in Ireland, are Irishmen still fighting for political status and still being brutalised for doing so? We ask for your continued support for these captured volunteers who will never submit to degradation and criminalisation. 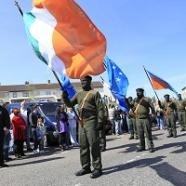 We send greetings to the IRA unit in Portlaoise and send solidarity and support to republicans held overseas. Óglaigh na hÉireann call on any young nationalist who may have been sold the lie that the RUC/PSNI is somehow an reformed, non political police service to think again, those who think they are serving their community are in fact serving the occupation and will be treated as such. The GAA, Catholic church and constitutional nationalism will be unable to protect those who turn traitor, they are as liable for execution as anyone else regardless of their religion, cultural background or motivation. The IRA repeat our warnings to civilians to stay away from the scenes of IRA attacks or alerts, we have noticed a pattern developing whereby the RUC/PSNI are deliberately putting civilians at risk. These so called modern day heroes were brave enough to allow hundreds of non combatants to pass a large IRA bomb in Newry,we do not believe that this was sheer incompetence of their behalf but a calculated action aimed at putting civilians in the danger zone to protect themselves and discredit republicans. With this in mind we ask both the public and all volunteers to be careful and vigilant, with the occupation forces coming under increased pressure from the resistance movement they are more likely to take drastic action out of desperation. It has come to the attention of the republican leadership that in a number of areas across the country criminal gangs are using the cover of republicanism to further their own selfish ends, this will not be tolerated, a harsh sentence will be dealt to anyone misusing the name of the IRA. Too many have paid the ultimate sacrifice in pursuit of our noble ideal to allow it to be sullied by criminals masquerading as republicans, anyone involved in this should stop and stop now. Óglaigh na hÉireann urge all self respecting Irishmen and women to resist the upcoming insult that is the visit of a British monarch to Irish soil, the criminal free state government invite is not on behalf of the Irish people but to further the selfish interests of a self serving elite. Despite the best efforts of the media, big business, and other power blocks to portray this visit as acceptable we clearly state that the Irish people will not capitulate. The queen of England is wanted for war crimes in Ireland and not wanted on Irish soil. we will do our best to ensure she and the gombeen class that act as her cheerleaders get that message. Finally we wish to state clearly and unequivocally that the leadership of the IRA is not in any negotiations with the British government, Free state government or anyone that represents them. Those who continually repeat this lie must explain their actions and we must clearly question their motivation, to them we say, don’t judge the IRA by your standards. If the British are serious about discussing the restoration of Irish sovereignty then we will listen to their proposals, anything else is a waste of time. The IRA, in cooperation with others will continue to resist occupation to the best of our ability, anything less would be a betrayal of all those Brave men and women who fill our graveyards this Easter. Victory to the IRA, Beir bua. Sinn Féin’s main Easter Commemoration at the GPO in Dublin was addressed by the Party’s Vice President Mary Lou McDonald TD. The following is the full text of Deputy McDonald’s speech. Tagaimíd go dtí an áit stairiúil seo, Ard Oifig an Phoist, chun cuimhniú ar Éirí Amach na Cásca 1916 agus chun omós a thabhairt dóibh siúd a fuair bás ar son na Poblachta. Táimíd bródúil as na daoine sin uile, ach go háirithe iad siúd as Baile Átha Cliath. Irish Republicans gather here today, Easter 2011, at the historic GPO to remember with great pride all those who died in the cause of the Irish Republic. We take special pride in the memory of the Republicans of Dublin who gave their lives in the struggle for freedom. We make no distinction between the Republicans who died in 1916 and those who died in the struggle of our own time. This year marks the 95th Anniversary of the Proclamation of the Irish Republic and the 1916 Easter Rising. We honour the brave men and women, boys and girls who challenged the British Empire and asserted the right of the people of Ireland to national self-determination. Dublin is a great city and it’s great to be a Dub – in football, in hurling and in Irish Republicanism! This is the city that fought an Empire. This is the city where the Volunteers of Óglaigh na hÉireann and the Irish Citizen Army lit a beacon in 1916, a beacon that inspired freedom-loving people across the globe. Without question, our forebears, the soldiers of the Irish Republic, hastened the end of Empire. The Proclamation read by Pádraig Mac Piarais on this very spot 95 years ago set the agenda for the Irish people. That Proclamation asserted the right of the Irish people to the ownership of Ireland. Never was it more necessary to assert that right than it is today because the political Establishment in this State have trampled on the 1916 Proclamation. They have wrecked the Irish economy and sold what remains of our economic sovereignty to the International Monetary Fund and the European Central Bank. They have bowed the knee to international bankers and capitalists, to the IMF, the ECB and the EU Commission. The Golden Circle of politicians, bankers and developers have virtually destroyed the Irish economy – and they were bank-rolled by the same international bankers and capitalists and approved by the IMF, the ECB and the EU Commission. They committed these crimes against our economy but they want us, the Irish people, to pay the price. Well, our answer to them is ‘No!’ ‘No’ to the surrender of our sovereignty. ‘No’ to the IMF/EU deal. ‘No’ to the attacks on the pay of low to middle income workers. ‘No’ to savage cuts to health and education and social welfare. The political Establishment wants to tear apart the very fabric of our society and our economy in order to pay back the international speculators and money-lenders who gambled on the property bubble in this State. Sinn Féin stands with communities across this city and this country who are experiencing these attacks. We are campaigning for a reversal of the disastrous economic strategy begun by Fianna Fáil and the Greens and now continued by Fine Gael and the Labour Party. We are campaigning for a real way forward out of this economic crisis, a republican way forward, based on the rights of our people. It is entirely fitting that the political Establishment that has bowed the knee to the IMF/ECB is the same Establishment that is now preparing to bow the knee to the English queen when she comes here next month. Sinn Féin is opposed to that visit and we will demonstrate our opposition with organized events here in our capital city. Our events will be peaceful and democratic. They will make clear our opposition to a visit that is inappropriate, ill-timed and premature. There can never be normal relations between the Irish people and the British head of state while our country remains partitioned. I also want to support the call of Justice for the Forgotten for the British government to release for international, independent scrutiny all the relevant files in their possession on the Dublin and Monaghan bombings of 17 May 1974. If that is not done before the arrival of the English queen on that very anniversary then insult will be added to injury. I said at the start that it’s great to be a Dub. Let me add that it’s great to be one of four Sinn Féin TDs for Dublin and one of 14 in this State. I want to thank the great people of this city for electing Seán Crowe TD, Dessie Ellis TD, Aengus Ó Snodaigh TD and myself on 25th February. It was a magnificent result for Sinn Féin in Dublin. It’s still hard to believe the score for this city: Sinn Féin 4 – Fianna Fáil 1. I commend all those who have worked so hard for Sinn Féin in this city not only in the past year, but over many years, to achieve renewed and increased political strength. We are determined now to use our political strength to provide radical and principled leadership for the people of Dublin and for the Irish people as a whole and to advance, with them, towards a New Republic on this island. We have made tremendous progress. The North of Ireland has been transformed almost beyond recognition. What has brought this about? The Republican peace strategy, the Peace Process, the agreements negotiated by Sinn Féin, the partnership administration in which we share power with Unionists, the all-Ireland structures on which we insisted – all these have transformed the Six Counties for the better. The days of one-party rule, British direct rule and second-class citizenship for nationalists are over. Policing has had a new beginning. There has been demilitarization. The status of the Irish language has been enhanced. But much, much more remains to be done; above all we have to re-unite our country and our people, to end partition and to start building a New Republic for the 21st century. That’s the spirit in which Sinn Féin is fighting the Assembly and local elections in the Six Counties. The election campaign needs to be an all-Ireland effort and I would encourage people to play their part in those elections. Polling day in the Six Counties is a day of historic resonance for Irish Republicans – 5 May. On that day Bobby Sands died on hunger strike in the H-Blocks of Long Kesh. We remember Bobby, Frank, Ray, Patsy, Joe, Martin, Kieran, Kevin, Tom and Mickey. Ba laochra iad uile agus ní dheánfaimíd dearmad orthu go deo. The best way to honour their memory is to continue our work to achieve the New Ireland, the All-Ireland Republic for which they and so many others gave their lives. And in the words of the song: “This land is our land”. Let’s take it back! Rúnaí Ginearálta [The General Secretary of] éirígí, Breandán Mac Cionnaith addressed the socialist republican party’s annual Easter commemoration at the republican plot in Milltown Cemetery, Belfast. Below is the full text of Mac Cionnaith’s oration. A chairde agus a chomrádaithe, go raibh maith agaibh as an cuireadh le bheith anseo libhse inniú chun omós and onóra a thabhairt do na daoine cróga uilig a fuair bás ar son saoirse na h-Éireann. From a personal viewpoint, I’d like to say that I’m particularly honoured to stand at this memorial plot – the first name on which is that of William James Harbinson. As a child and later as a teenager, my parents would often take me and other family members to an old graveyard known as Laloo – some call it Port Mor – at the edge of Lough Neagh. We had no relatives buried there. The only reason my parents ever took us there was to visit the ‘‘Fenian’’ grave – the grave of William Harbinson – a grave where the headstone was then, and still remains, smashed in two and upon which there is no mention of his name. Harbinson was the most senior Fenian in the province of Ulster when he was arrested and imprisoned in Crumlin Road gaol. It was in that gaol he died in 1867. Belfast with its long and vibrant republican tradition, like so many other cities, towns and counties, across Ireland, has good reason to be proud of its contribution in every phase of the struggle for national liberation. As we gather here at Easter to remember the men and women of 1916, we also pay tribute to all those who gave their lives for Irish freedom. The struggle taken up by James Connolly, Micheal Mallin, Constance Markievicz and their comrades in 1916 was the same one which the Fenian Harbinson and his comrades had participated in decades earlier. That struggle was later carried on by Republicans of the highest calibre such as Liam Mellowes, Tomás Ashe and Joe McKelvey; by Republicans like Tom Williams, Seamus Burns, Sean McCaughey and Terence Perry in the 40s, through to more recent years when that same freedom struggle was continued by Jimmy Steele, Patricia Black, Bobby Sands, Joe McDonnell and many other courageous men and women whom we also remember today. Each and every one of those who gave their lives in pursuit of Irish freedom had to face the personal difficulties and hardships which involvement in that struggle brought to them and their families. Each was an ordinary person faced with extraordinary choices in extraordinary times. They were ordinary people like each of us here today who saw the injustice caused to their people by capitalist exploitation and by the foreign occupation of their country and who decided to take action. They could have ignored the injustice they saw around them and, instead, have chosen to have lived quiet lives. But their desire for freedom and justice in Ireland was such that they committed themselves fully to the Republican cause. This year also marks the thirtieth anniversary of the 1981 hunger-strike which resulted in the deaths of ten republican prisoners in the H-Blocks of Long Kesh. The sacrifice made by those ten volunteers and their families politicised an entire generation, and demonstrated the sheer dedication, selflessness and bravery of Irish republicans. It is right that we remember them and all those who died in the freedom struggle through commemorations such as this and that we also rededicate ourselves into that same struggle for an Irish Republic. Easter is a time for each of us to remember those close friends and comrades who have given their lives in pursuit of our republican ideals and goals. It is a time to remember the sacrifices endured by their families. It is also a time for reflecting on the ideals which motivated them. At Easter each year Republicans recall the words of the 1916 Proclamation - an historic document - one of the most progressive documents of its time. The Easter Rising remains one of the defining events in the modern history of Ireland. The Proclamation of Easter 1916 remains one of the defining political documents of Irish Republicanism. It spells out the demands for national self-determination, for social and economic justice and democracy, of cherishing all the children of the nation equally, of claiming the wealth of Ireland for the people of Ireland. Those who came out in 1916 and in subsequent decades were men and women of principle; men and women with a vision for a new, equal and free Ireland. The events of 1916 are quite well known - what most people are unaware of is that the legacy of 1916 led to an intense class struggle which was waged in the years between 1918 and 1923. There were 5 general strikes in southern and western Ireland between August 1918 and August 1923. Workplace occupations and land seizures began taking place and in Limerick city and other areas, workers’ soviets were declared. Women got involved in politics on an unprecedented scale, being involved in the war and in the underground republican political apparatus. The war for independence unleashed struggles by workers and small farmers for control of factories and the breaking up of large ranches. The revolt for Irish independence became a revolt of the exploited classes against their domestic oppressors as well. That is a legacy of 1916 which is seldom mentioned – it is a legacy which all socialists and Republicans would do well to remember, commemorate and to emulate in coming years. The two states on this island which were created through partition were, and still remain, hostile to the interests of Irish workers and have acted against the struggles of Irish workers time and time again. It goes without saying what the position of Connolly and the Irish Citizen Army would have been on present day trade union leaders who fail their members day and daily in this country at a time when capitalism is in crisis and when the working class, the unemployed, the ill, the elderly and the young are under attack across the whole island. It also goes without saying what the position of Connolly and the ICA would have been to those political parties who claim to espouse working class and republican teachings but who endorse partition and who spend their time knocking on the doors of the right-wing establishment parties seeking coalition government. Connolly made his own position plain and unambiguous in 1910 when he concluded his pamphlet, Labour, Nationality and Religion, in the simplest and most straightforward terms: “The day has passed for patching up the capitalist system, it must go”. In view of the events in Ireland and elsewhere of the past few years; the economic crisis caused by the greed of bankers, private landlords and property developers, culminating in the intervention by the EU and IMF in the 26 Counties; and the 4 billion pounds of cuts due to be implemented by the Stormont Coalition; it is clear that message of Connolly’s remains as true today as it was over a century ago - “The day has passed for patching up the capitalist system, it must go”. Ireland remains divided by imperialism. The livelihoods of the vast majority of Irish people are controlled by undemocratic capitalist forces which stretch from this island to London, to Washington and Brussels. They are no different to those same undemocratic controlling forces which the Citizens Army together with the Irish Volunteers and other progressive forces mobilised against in 1916. Those undemocratic forces, are supported, both North and South, by a pliant, subservient and self-serving political class. The extent of that subservience can be seen clearly in the manner of their meekness to the dictates of the EU/IMF. It can be seen in absence of their formal opposition to the visit by the honorary head of the British armed forces while Britain maintains its grip on the Six Counties. That subservience can be seen in their daily collaboration with Britain. It can seen in their lack of active opposition to repressive and draconian British laws, or to Britain’s spying operations conducted by MI5, or to Britain’s deployment of its troops “in mufti” throughout the Six Counties. Those who support and endorse the structures of partition have placed themselves firmly in the camp of the counter-revolution. Make no mistake about this, comrades, over the next five years as the centenary year of the Easter Rising draws near, the forces of counter-revolution will embark upon an unprecedented revisionist propaganda campaign aimed at trying to persuade the public mind that the objectives of 1916 have been secured through the partition of our country. We should also remember that the Irish freedom struggle has always had an international dimension. From the United Irishmen and their connections with the revolutionary Republican government in France, to the IRB and their links with the First International; from Connolly and his active internationalism, to those Republicans and socialists who joined the International Brigades and who fought and died fighting fascism in Spain. Today, as we remember our own fallen comrades, let us also remember the fallen comrades of other liberation struggles in Palestine, Latin America, and Africa. While we are gathered here to pay tribute to fallen comrades, let me make it clear that, unlike some others, I do not pretend, or presume to know, what the thoughts or attitudes of those fallen comrades would be on the present situation, or indeed, on any of the developments which have impacted upon our struggle over the last number of years. I can only state one fact with certainty. The objectives to which they pledged their allegiance; the objectives for which they gave their lives are the same objectives which were clearly and unmistakably enunciated through the IRB Proclamation of 1867, the 1916 Proclamation and the Democratic Programme of 1919. Comrades, those objectives have not been achieved. Settling for anything less than the complete achievement of those Republican objectives was never an option for all those whom we remember and honour today. The business of Easter 1916 remains unfinished. Even the most cursory reading of the 1916 Proclamation reveals that the goals and objectives of those who fought, were imprisoned and who were executed are far from complete. While today we celebrate and commemorate the 95th anniversary of the 1916 Rising, more importantly we commit ourselves to continue the struggle for a democratic, independent, and sovereign united Ireland. An Ireland whose total resources will come under the control of the ordinary working people of this island regardless of gender, religion or race - a truly free Ireland. That is our objective. To settle for anything else dishonours the vision of those we commemorate today. Many previous generations of Republicans experienced dark and dispiriting times. They responded by re-engaging in various facets of the struggle, by re-organising and by building new networks and new alliances with other progressive and radical forces in order to try and bring about revolutionary change. That is the task before us today, tomorrow and every day after that. The task for each of us is to help build a new Republican and revolutionary potential to drive that vision of a new Irish Republic forward and to re-awaken the inherent desire for true political, social and economic freedom and justice that exists among all people, young and old alike, in our villages, towns and cities, in our workplaces, in every one of our communities. Pearse, Connolly and their comrades later proved that the Defenders of the Realm were completely wrong in their thinking and their assessment of Republicanism. Today, a similar thinking and assessment of Republicanism pervades the mindset of the British government and of the establishment parties in both the Six and Twenty Six Counties who have accepted a two state partitionist settlement and who seek to demonise and criminalise those of us who oppose partition and the corrupt, unjust political, economic and social systems it has spawned. As we leave here today, comrades, let us go armed with the firm intention of proving such thinking by Britain and her collaborators in Ireland to be completely wrong again. Let us remember our patriot dead, our fallen comrades and our friends with pride, not for the sake of remembrance only, but so that their example will encourage us all to continue to struggle onwards to achieve their vision of a free, and truly independent, 32 county Irish Socialist Republic. Beirigí bua [Success to you] comrades. Ar aghaidh linn le chéile. [We go forward together]. Is mór an onóir orm a bheith ag seasamh anseo inniú an Casca seo. Bhí sé san áit stairiúil seo a rugadh Poblacht na hÉireann nócha is a cúig bliana ó shin. Just a few feet away from us here Pearse read the Proclamation of the Irish Republic and declared to the nations of the world that we are a free people. There are few dates as significant in Irish history as Easter Monday 1916 and few places more sacred than here at the GPO. The tradition was passed down through every subsequent generation. Those generations were not found wanting. In 1919 Dáil Éireann was established and defended in arms against British aggression. Then came the Treaty and the Second Defence of the Republic against the Free Staters. The following generation endured the Broy Harriers, internment, military tribunals, execution, hunger strike and the cat o nine tails in Portlaoise. They and the Republic endured to hand the tradition down to the men and women of the Fifties and Sixties who for over five years fought gallantly against superior forces despite hundreds being interned. Those who came after again had to endure the SAS, the UDR, Loyalist death squads, internment, the hell of Long Kesh and the Hunger Strikes of 30 years ago. Still they and the Republic endured. Now that tradition has passed to this generation. It is a heavy burden when you consider those great heroes who have passed it to us. As Pearse and the men and women of 1916 did we must keep faith with our past. Ideally we shall hand not just a tradition on to our successors but a free and United Ireland. We owe it to all those who have fought and died for Ireland to try our utmost to finish the job they started. We owe it to future generations of Irish people to ensure that they do not have to fight and die for a free Ireland. We must be the generation that rids Ireland of the British occupation once and for all. There are many in Ireland today who will tell you that there is no British occupation. They will try to tell you that the 26 County State is “Ireland” and that Leinster House is the seat of the Irish Republic. This is simply revisionist nonsense. The historical facts are that the 26 Counties were formed by a British Act of Parliament and not by the will of the Irish people. The present set up emerged from the defeat of the Irish Republican Movement by the Free State. The Irish Republic as stated in the Proclamation “cherishes all the children of the nation equally”. It is inherently revolutionary and Socialist in nature. The 26 County State is, by contrast, inherently counter-revolutionary, conservative, Capitalist and subservient to Britain. Most people are familiar with the desire of Irish Republicans to over throw British rule in Ireland and destroy the 6 County Statelet. After all there is a very visible British military and governmental presence there that so long as anyone can remember has been opposed in arms by Irish Republicans. Republicans must reiterate that if Ireland is to be free, if the Irish Republic of Easter Week is to be restored then the 26 County State must fall as surely as must the 6 County Statelet. The Irish Republic stands in direct opposition to the corruption of the 26 Counties. The Irish Republic restores power to the people of Ireland and by returning the wealth of Ireland to the people of Ireland it frees them economically as well. The Republican revolution must continue not just to rid Ireland of British occupation but to rid Ireland of the native traitors as well. Pearse said: “There are many things more horrible than bloodshed and slavery is one of them”. What are the Irish people now but slaves? Slaves to England in the Six Counties and slaves to the capitalist elite in the 26. Fine Gael and Labour act as overseers for the slave owning Bankers, the IMF and EU. And like Uncle Toms many Irish people are content with their slavery. As long as they’re household slaves getting the odd crumb from the master’s table and not out in the fields and the factories with the majority of us they are happy with the status quo. The Irish people are being bled dry for the sake of international capitalism. It is not the blood of the working slave that must be shed but the blood of the bankers and the corrupt politicians who have sold us into perpetual slavery. The insanity of the willing slaves must end! Ireland will never be free until both partitionist states here are destroyed for good and the glorious Irish Republic erected in their stead uniting Catholic, Protestant and Dissenter under the common name of Irish men. Republican Sinn Féin believe that Éire Nua and Saol Nua our governmental and economic policy documents would make the Irish Republic, envisioned by Pearse and Connolly, a reality. Power would be restored to the people and the wealth of the nation would belong to all of us. This mentality has returned of late. On Easter Thursday night 1916, Pearse, staring imminent defeat in the face, wrote that they had “redeemed Dublin from many shames.” This unwanted visit is a chance for Dubliners to redeem their great city once more. They should ignore the cat-calls and Union Jack waving of the new breed of Redmonites and West Brits and stand shoulder to shoulder with Irish Republicans in defying the head of the British State and her subservient Irish lackeys. The following statement was issued in the name of the leadership of the Republican Movement and was released by Republican Sinn Fein. On the 95th anniversary of the momentous Easter Rising of 1916 the Leadership of the Republican Movement once again sends greetings to all who are gathered in commemoration at the graves of the patriot dead or at monuments in their honour. From Easter Sunday 2010 the Republican Prisoners in Maghaberry jail, Co Antrim embarked on a five-month long protest in support of their just demand for political status. That status was taken away when the Provisionals signed the 1998 Stormont Agreement. On August 12 last this protest ended with an agreement in which facilitators, including the Irish Congress of Trade Unions and others were involved. More than six months later key elements of that agreement were not implemented. Specifically, the BOSS chair x-ray machine was installed to replace the strip-searching of prisoners, but despite the availability of that machine the original degrading practice was continued. As a result Republican prisoners refused to cooperate with further strip searches. This, in turn, led to two prisoners being denied parole. The facilitators of the agreement returned to the prison in March and met the prisoners and the prison governor. The governor refused to abide by the terms of the August Agreement. The responsibility for reneging on the compact entered into in good faith lies with the Stormont Minister for Justice who sits at the cabinet table beside the Provisionals. The Provos repeat Bobby Sands’s name while as the new jailers they deny Bobby Sandss objective of political status to present-day Republican prisoners. They flaunt the Easter Lily in Leinster House while they punish the prisoners for wearing an Easter Lily in Maghaberry Prison. Meanwhile the Continuity IRA has been carrying the war to the enemy and Republican Sinn Fein has campaigned tirelessly in support of the prisoners. To the Republicans prisoners in Maghaberry and Portlaoise the leadership sends greetings and congratulates and salutes their courage and sacrifice. In the 26 Counties the hard-won rights of working people are under attack and must be defended. World-wide corrupt practices and bad management at home has resulted in almost half-a-million being unemployed and 1,000 per week emigrating in search of work. Whatever economic independence existed has now been ceded to the EU and the IMF. Real revolutionary change is necessary based on the principles of the 1916 Proclamation. EIRE NUA and SAOL NUA provide the basis for such a New Ireland. Now to put the seal on the surrender process and the 1998 Agreement, which is not a settlement, the Queen of England is being brought to the 26 Counties the first such occasion in 100 years. This is a political action designed to normalise and make acceptable British rule in Ireland. Republicans must protest and tell the world that the English government will never be normal or acceptable here. The struggle is not over. It never will be over until the English government leaves Ireland for all time. Spending 8 million on security for the Queen of England is sheer waste of the peoples money. Up to this when the Dublin Administration and the British government joined together with Stormont in repression and coercion, their objective was, of course, to destroy the Republican Movement. In this they always failed. In our time, they seek to go further. They are attempting to demolish the basic idea of Irish Republicanism, Irish national independence and control of our own natural resources. They have given away our Six north-eastern Counties to England and have handed over our natural resources for nothing to multi-national companies. The creeping tide of Anglicisation sweeps over our people gradually every day. In all of this they have the support of former comrades masquerading as Republicans. We must resist this surrender process. We must be true to the ideals of the men and women of 1916 and of those who stood in the Bearna Baoil, the Gap of Danger, before 1916 and since 1916. Let us arise!